Thank you to all our donors in 2017! We are so very grateful for you! More donors are needed in 2018 to keep pace with the research. 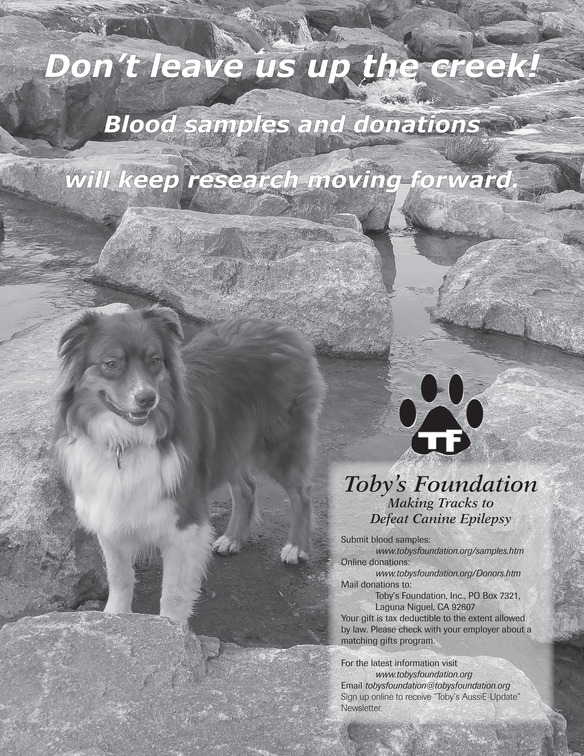 If you have not donated to Toby's Foundation in a while or have never made a donation please make a donation now. A donation of any size is needed and much appreciated! We want to give special recognition to two organizations, ASCA and ASHGI, whose generous donations in 2017 helped us sponsor much needed canine epilepsy research! On the donor's page of our website there is a complete list of all individual donors and all clubs that have supported us. We are deeply grateful to these clubs and individuals and all our donors including the companies that have made matching gifts! We cannot do it without you! Please click here to view our donors page. REMINDER Purple Day is March 26th! Please wear purple on that day to show unity with people and their dogs all around the globe to raise awareness about epilepsy for humans and canines! "Epilepsy is the same disease different species!" If you would like to send us a photo of you and/or your dog for purple day we will put it up on our Facebook page. For information on purple day activities please go to purpleday.org. Your gifts help us to support the research to find the genes responsible for canine epilepsy and develop a screening test and more effective treatments for dogs suffering from this disease.